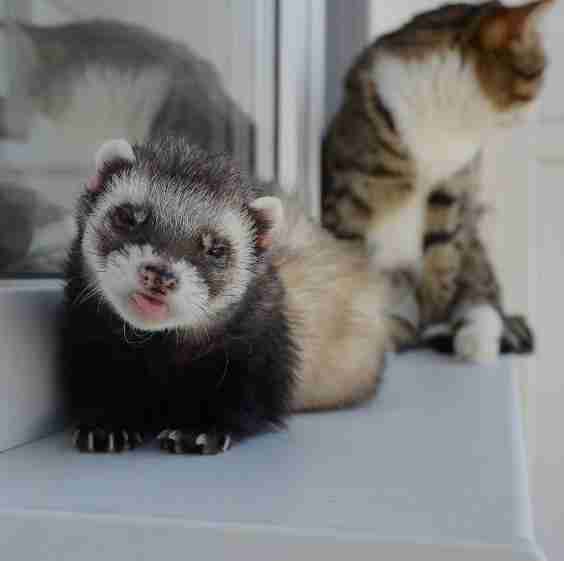 "Keanu is a very sociable ferret and accepted Rexie without any problem." 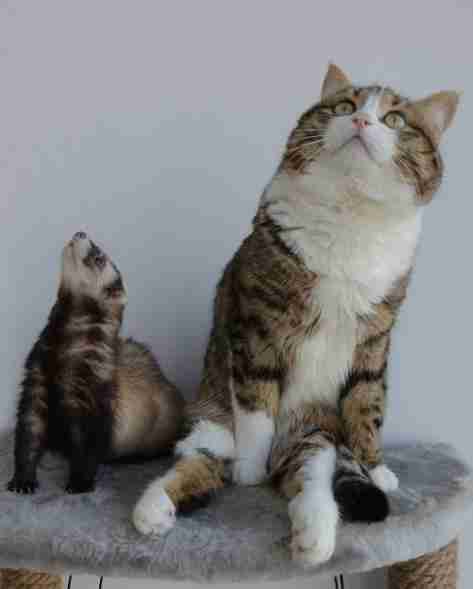 Rexie, a cat, and his brother Keanu, a ferret, have gotten along ever since Rexie first joined the family in February 2015. The two live in Yekaterinburg, Russia, with their mom, Dasha Minaeva. 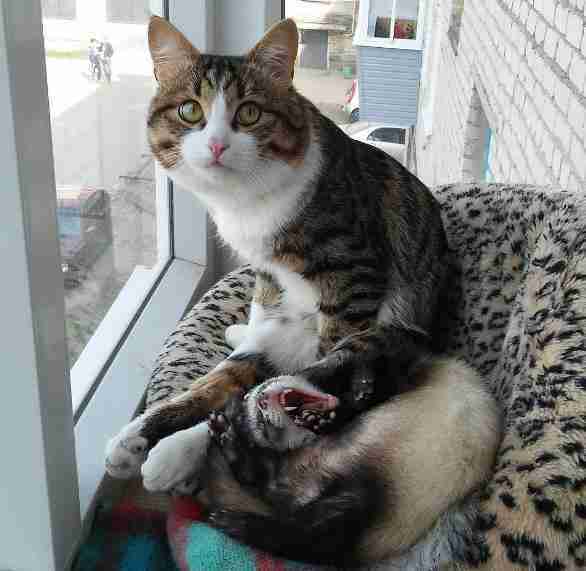 Minaeva had Rexie ever since he was a kitten. 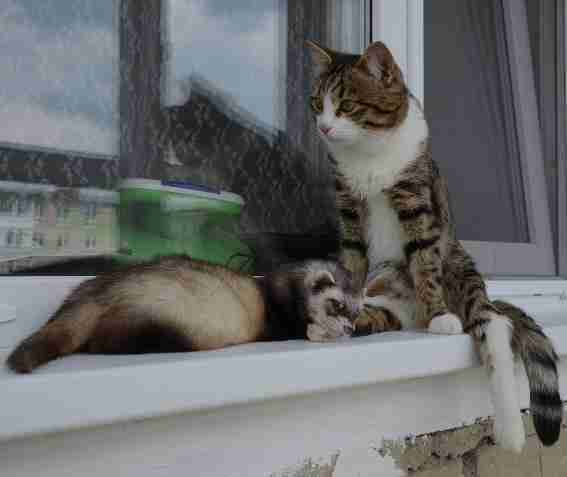 She first got him when friends had some kittens to give away, and he was a healthy, normal cat. Months later, however, Rexie's life took an unexpected and sad turn. 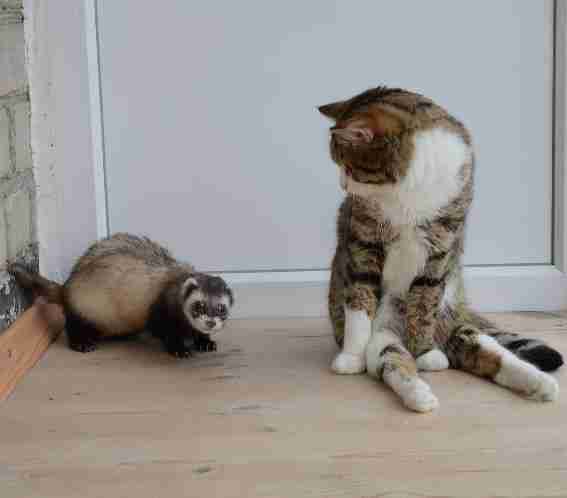 When Minaeva left Rexie with family members to babysit him, he was left unattended with children "who apparently weren't too kind with my cat," she told The Dodo. "After some sort of 'play,' he ended up having his backbone broken. He lost the ability to use his rear end." Although Rexie was permanently unable use his back legs, Minaeva was determined to make sure that his quality of life wouldn't be affected. 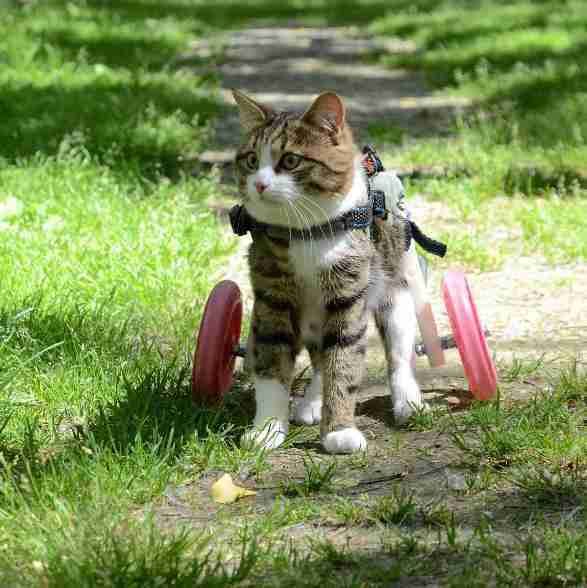 Minaeva took the cat to physical therapy, where he started his rehabilitation, learning how to move using just his two front legs. 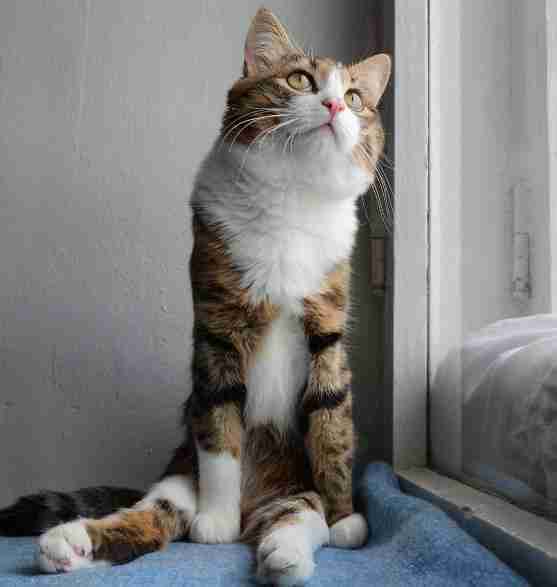 "When he took his first steps on only his two paws, it [was] discouraging [for] him, probably because it was hard to start using just two legs," she said. "But with time his muscles got stronger and wasn't a problem anymore. One thing is he can't urinate on his own so has to have his bladder manually [emptied]." 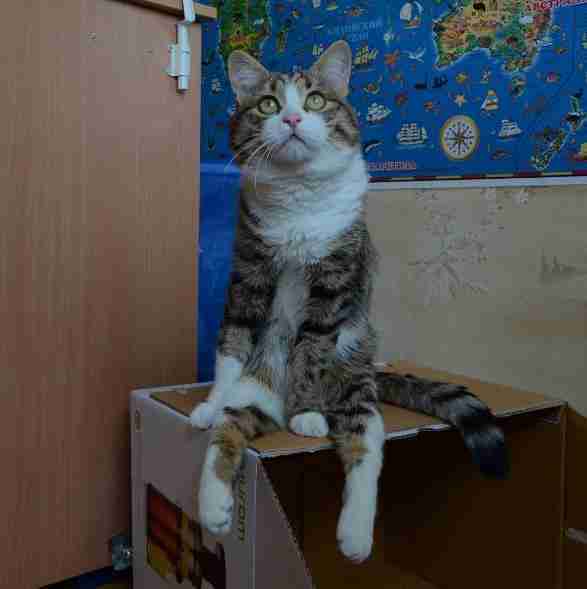 Minaeva said although her family members feel guilty for what happened to her cat under their roof, it's a little too late for Rexie - though he's managed to overcome his challenges regardless. 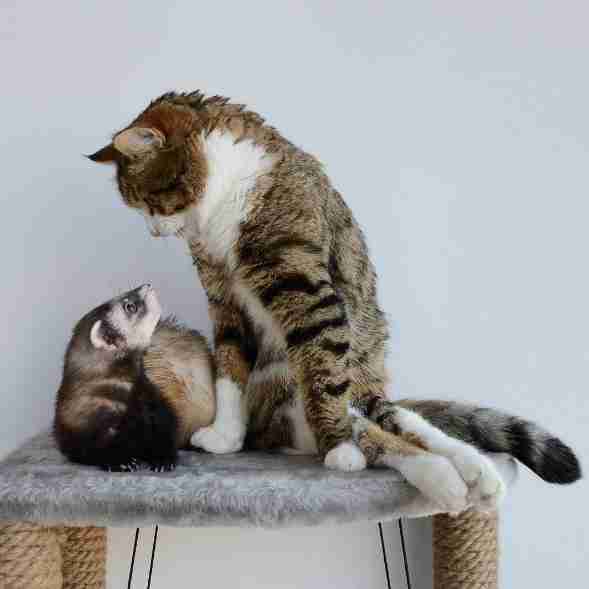 Minaeva already had Keanu when she brought Rexie home. 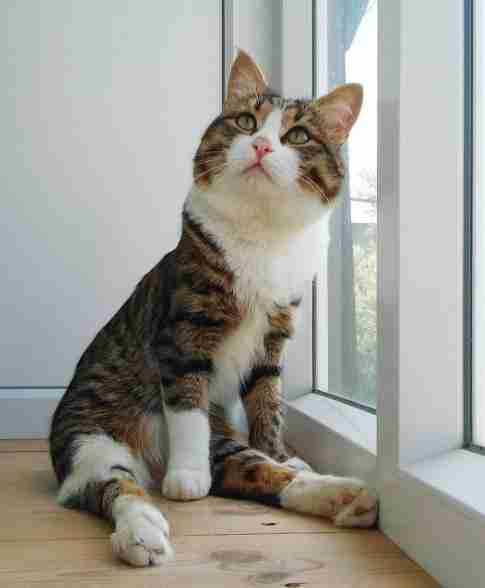 She rescued Keanu, who is now 4 years old, from a pet store, where she saw he was in terrible condition. "He was too tiny for his age, partially bald," she said. "I guess pet shop workers didn't care about the condition of the little guy." Today, Rexie, who is turning 2 next month, behaves just like any other cat, though his close relationship with Keanu is especially unique. 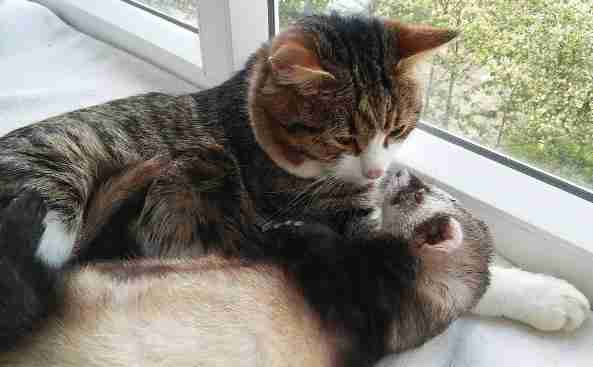 "Keanu is a very sociable ferret and accepted Rexie without any problem," Minaeva said. 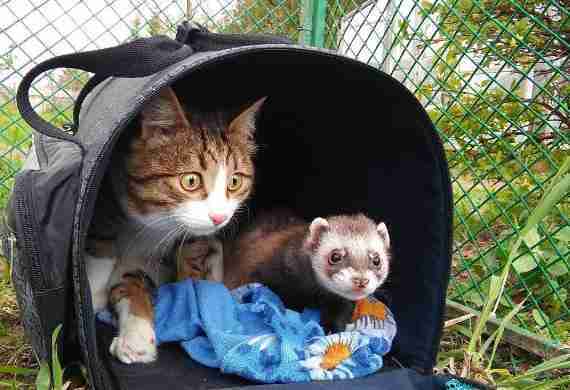 "Actually, it was the ferret who chased the cat around. Now it's Rexie who's attached to Keanu and always seek ways to get him into play." It's hard to tell by looking at Keanu today that he was once an unhealthy animal - especially when it comes to playing a game of chase with Rexie or cuddling close to his brother's side. Rexie appears to have no trouble keeping up as well. 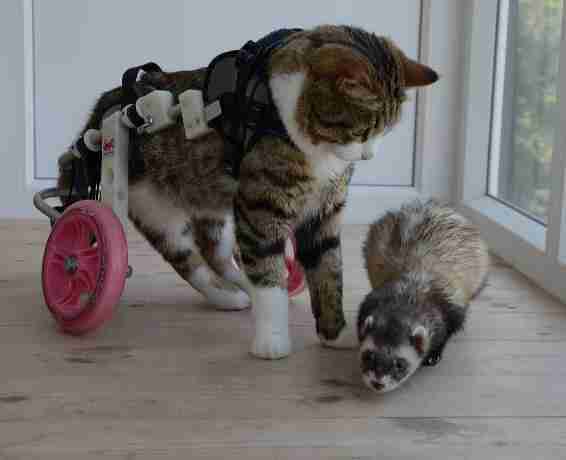 Although Minaeva bought him a custom wheelchair to help him get around, she said that, in the end, Rexie prefers the use of just his paws. 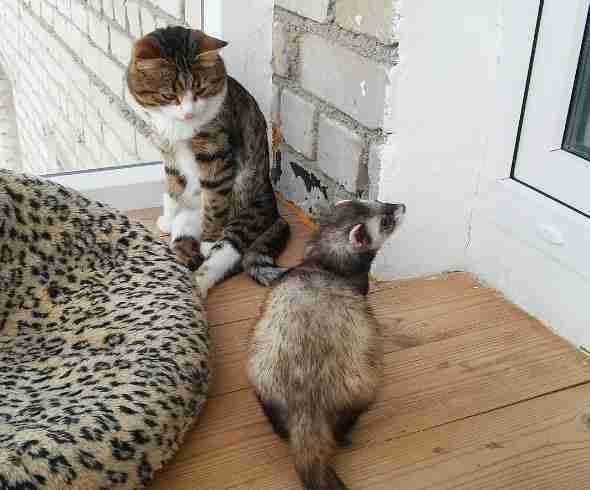 "Keanu is cheerful as most ferrets are, and pretty inquisitive," Minaeva said. 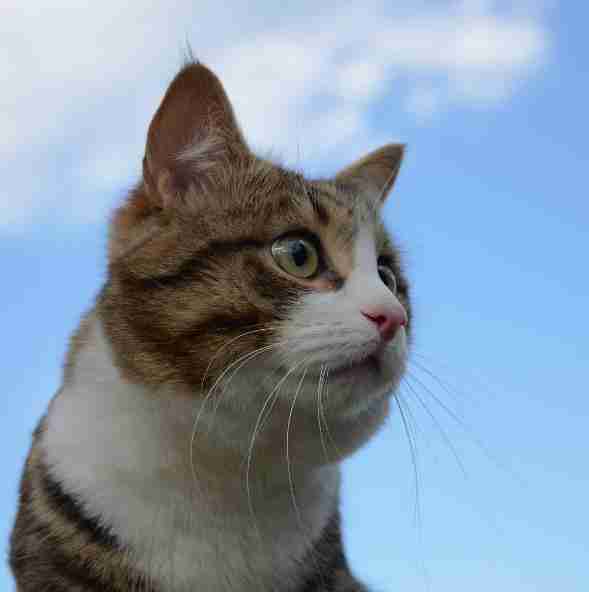 "Rexie is pretty laid-back and lazy, very loving too. He just enjoys his life as it is." You can keep up with Rexie and Keanu on Facebook and Instagram.